Have you ever met someone or walked into a place and suddenly…feel – a little uncomfortable? Maybe you couldn't quite find the right words to describe that feeling, but you just knew something did not seem quite right? That gut reaction was your intuition telling you to be wary. Intuition is an immediate insight formed on past similar experiences. Have you ever had this feeling about a website? A social media page? An email??? Consciously or subconsciously, your intuition guides your ability to trust what you are seeing and reading online. 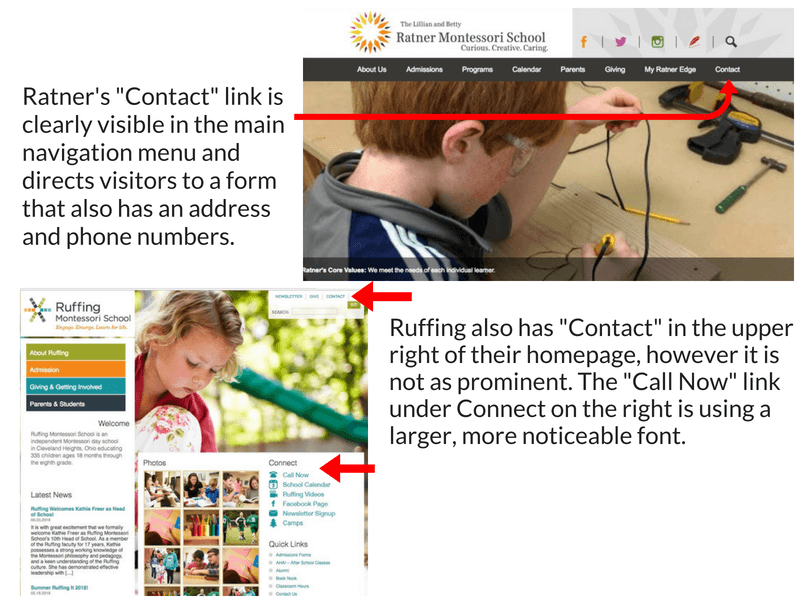 Both schools utilize a "Contact" link which takes a visitor to a contact form. However, if we look closer at their contact forms Ratner's contact form is above the fold, uses reCAPTCHA protection and is clean and simple in design; thus minimizing the opportunity for a visitor to click off the form. 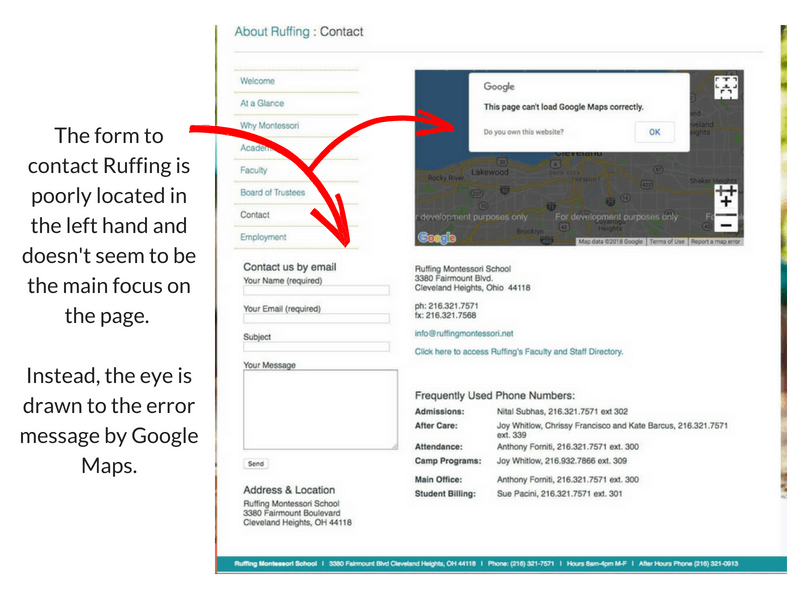 Whereas, Ruffing's contact form seems to take a back burner to the other more prominent links and to the Google map at the top. If a visitor wants to complete the form, they might have to scroll down to finish the form before hitting the "send" button. 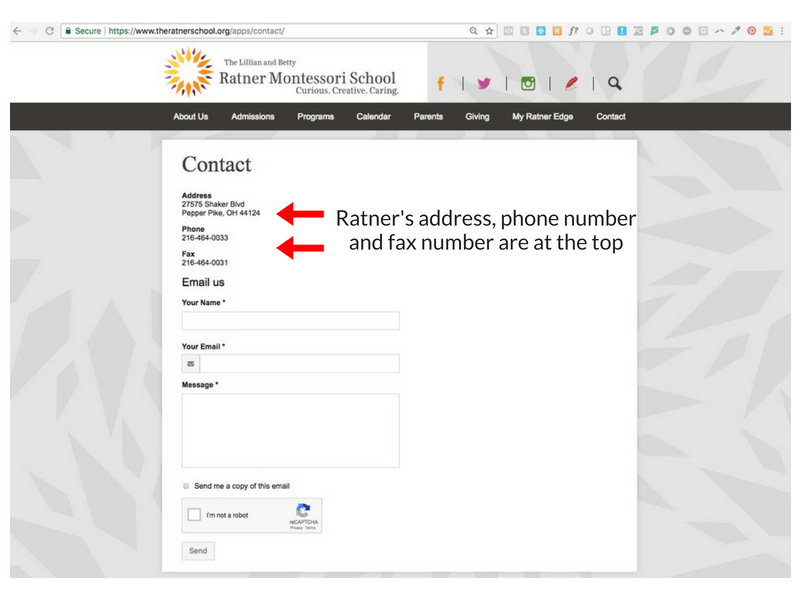 In the photo above, Ratner's Contact form is above the fold and clearly displays the address and phone number at the top. The form takes center stage on this page. 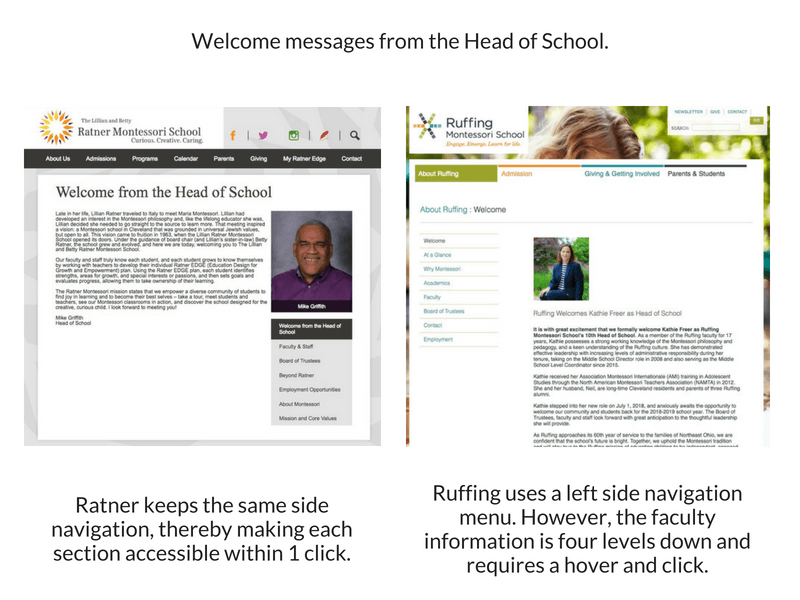 By contrast, in the above image Ruffing's contact form is in the left column and seems to take a back seat to the other elements on the page. Ratner Montessori's menu organization (image below) is organized around their visitor experience. 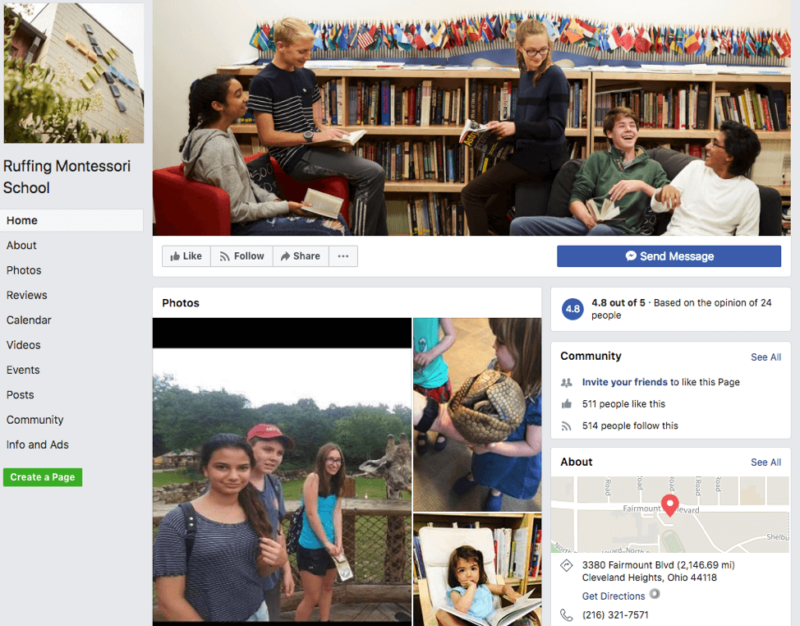 The navigation menu on the right is sequenced in the order a visitor might want to explore: Welcome from the Head of School, Faculty, and Staff, Board of Trustees, Beyond Ratner, Employment Opportunities, About Montessori, and then finally Mission and Core Values. If your business is accredited by the Better Business Bureau, is a member of the local chamber of commerce, or has any other professional memberships, these should be listed on your website. Details matter in building trust. Ratner loses a possible engagement opportunity when the "Read More" button under key metrics directs visitors to an Events Calendar instead of a page that substantiates their numbers. Whereas, Ruffing Montessori does a great job of listing their accreditations. Our only recommendation would be to list "Recent Accolades" in descending order. Ratner Montessori lists key metrics; however their link to "Read More" goes to an events calendar. As a visitor, this would be confusing as I would be expecting to read more about their teacher/student ratio, their accreditations, and so on. Look at the images below. Visually, which website creates a better first impression? Although they both use main photos, they differ in design and mood. Ratner Montessori's photos and website design overall is more professional. It is organized and uses white space. When making decisions for their children’s education, however, parents look to other cues to understand the environment. Images speak volumes. The banner of sliding photos shows Ratner's children smiling and happy. Visually, it seems to set the expectation for the culture of the school. Ruffing’s background photo sets a different tone. It shows a child who seems to be focused and deep in concentration. Although both images depict positive situations, Ratner’s image slider prominently highlights happy children and may elicit a different gut reaction than Ruffing’s serious student. When thinking about your website menu structure, you want to consider how many clicks it will take for the desired action to be completed. For example, every page on Ratner Montessori's website is one click away. They are not using submenus. 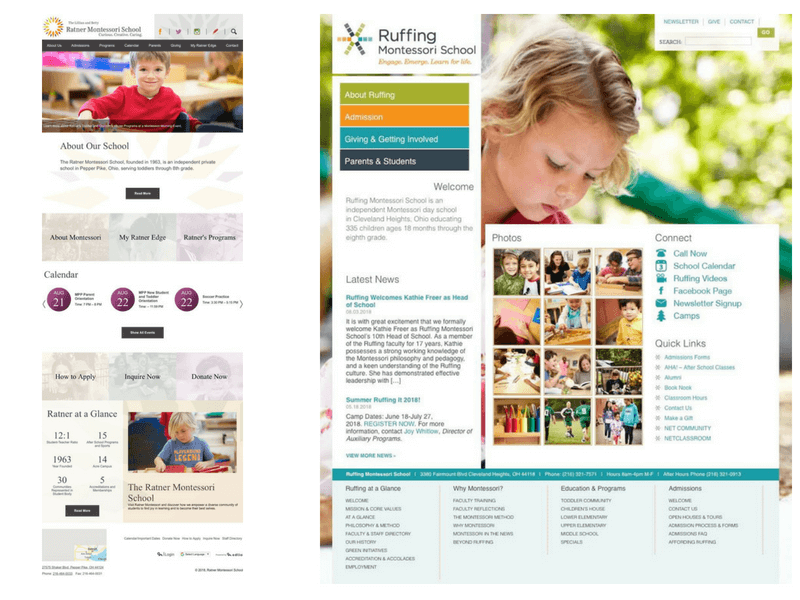 With Ruffing Montessori’s website, it takes more than one click to learn more about their art program. When it comes to design, you want the desired conversion path to be as easy and direct as possible within one or two clicks. Anything more and you may lose potential leads and inadvertently create a negative experience.